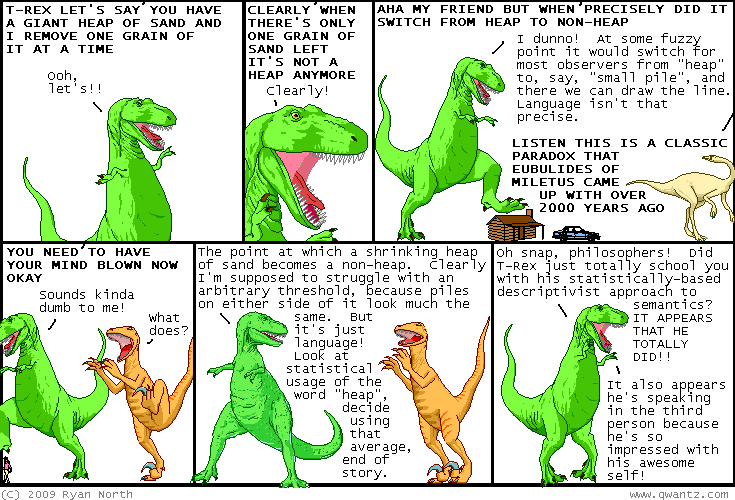 Dinosaur Comics are my favorite comics. Today, anyway. If you’re not familiar with the DC conventions, go browse a few dozen; you won’t regret it. Tomorrow my favorite may be Red Meat; it was, back on October 27, 1977, and it could be again. Don’t say I didn’t warn you. Archive Binge provides a slick way to go through Dinosaur Comics or any of a number of web comics in their entirety without a marathon session. The site allows you to create a RSS feed of episodes at the rate you want to go through them, follow the feed from there.